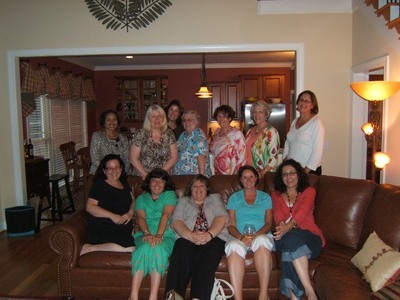 Two North Carolina book clubs in one! What could be bad? The Winston Salem Book Club has been meeting since 1995 and the Salem Glen Book Club, since 1998 (upstarts). Not pictured: Beth's Co-Pilot, Ed, who "like Tim was just chilling and emitting quiet strength from his man room in the basement." As Beth, who arranged my visit put it, "Winston Salem tends towards more serious, inspirational, or challenging reads," while Salem Glen tends "towards more popular fiction, with a 300 page limit. I am happy to say your delightful book filled both orders." Mix sugar and crushed graham crackers in saucer. Rub rim of martini glass with key lime juice, then press into crushed grahams and sugar to make a rim. Add ice to shaker, add ingredients, and shake to mix and chill. Strain into cocktail glass. Quadruple recipe if its been a hard day, but hide your bus keys. Walk to beach and chug thinking the whole time about what a bummer it will be to go back to civilization. Quadruple recipe supplies 100% of daily recommended requirement of Vitamin C.
It hasn't been that hard a day, but I'm sure I do need more Vitamin C.
This page contains a single entry from the blog posted on July 30, 2009 9:05 PM. The previous post in this blog was The South vs. The North (Or Just vs. Me). The next post in this blog is Happy Birthday to Tim.